Given that sand finds its way into every nook and cranny of your person when you go for a swim, the prospect of dining on the beach is even less appealing. 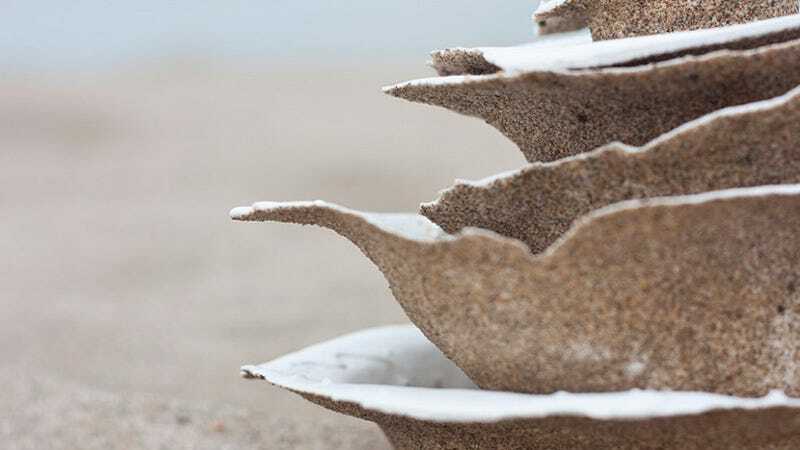 So what possessed artist Victor Castanera to create a series of plaster-based dinnerware cast from the natural contours of a sandy beach? It's unfortunately one of those art-for-art's-sake deals, and the project is supposed to play off the ever changing surface of a beach while commenting on the mass produced commercialism that dominates our society. But if buying a set of plates at a department store means you can dine without that horrible crunching feeling when you bite down a grain of sand, who could find any reason to complain? Oh, that's right, an artist looking for publicity.